Independent Health is proud to sponsor Larkin Square and the many events that are offered here to the Western New York community. We are excited to help promote health and wellness, and get others in community engaged in their health. Be sure to keep an eye out for our RedShirts℠ who will be at Larkin Square with healthful information and activities throughout the year! As part of our healthy initiatives, Independent Health and Larkin Square are continuing our collaboration participating food trucks to offer up Healthy Options menu items during Food Truck Tuesdays. 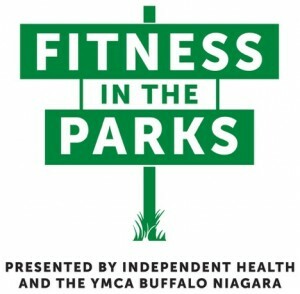 Fitness in the Parks at Larkin Square: Mondays and Thursdays, May 31 – August 23, 2018 at 5:30 pm. For more information and the complete schedule of Fitness in the Parks classes and locations, visit www.independenthealth.com/fitpark. We look forward to working together to continue to bring healthy initiatives to Larkin Square! These are just some of the ways Independent Health and the Independent Health Foundation are helping Western New Yorkers lead healthy lifestyles. For a full list of our events around town, visit www.independenthealth.com/events. For information on making informed decisions when dining out, follow Healthy Options Buffalo on or visit HealthyOptionsBuffalo.com. Enjoy free yoga on Monday evenings in Larkin Square thanks to Independent Health! Enjoy free kickboxing in Larkin Square thanks to Independent Health! Free yoga classes courtesy of Independent Health and YMCA.